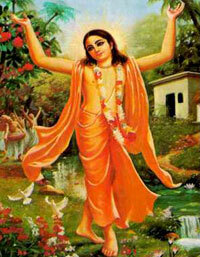 Sri Chaitanya was born in Bengal about 1486. He was a great scholar and pundit however in his early twenties he became absorbed with devotion for Lord Krishna. He forsook his worldly career and spent his time as an ascetic, a wandering monk. He spent his time in Kirtan (devotional singing) and meditation. Sri Chaitanya left a profound legacy on the spiritual and cultural outlook of India, especially Bengal. He did not adhere to the rigid caste system and accepted Muslim disciples as well as Hindu disciples.